Star SM-T300 - Portable Thermal, Rugged 3", Android, Windows, Bluetooth/Serial, Gray, No MSR, Tear bar, Includes AC Adapter, Belt Clip, Battery Pack. Also known as SM-T300-DB50. 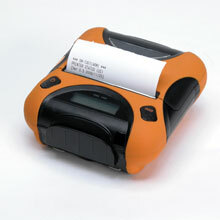 The Star SM-T300 may be utilized for workers requiring handhelds to seamlessly print to the worker's mobile printer. Its rugged and waterproof design coupled with a long battery life makes the SM-T300 a welcomed option for applications in harsh outdoor environments, such as service & delivery, public safety and utility applications. In addition to easy drop in & print paper loading and print speed of 80 mm per second, the SM-T300 also features an LCD display, magnetic stripe reader and comes standard with a Bluetooth connection. Shoulder band for SM-T300. Also known as SHOULDER STRAP T300. Car charger for SM-S/T model portable printers. Also known as Car Charger SM-S/ TV2. Battery charger (4 bay cradle) for SM-T300. Also known as 4P CHARGER T3 US. Mobile Printer T3 Battery Holder, Battery Charger (1 Bay Cradle) For Sm-T300 And Sm-T300I Mobile Printers. Also known as BATTERY HOLDER T300. The Star 39631212 is also known as Star Micronics	STA-39631212	.